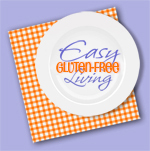 I hope you have been following along for our event, 30 Days to Easy Gluten-Free Living. So far we are on day 10 and there has been so much wonderful information to make life easy. We’ve learned about grocery shopping, how to start living gluten free, smoothies, convenience foods, power bars, easy meals, chocolate peanut butter pie, cookie bars, baking and travel. Like I said that’s a lot already. If you missed out on any of those, here is the entire schedule with the links to posts that have already been shared. Keep this list handy so you don’t miss out on any more. If you misplace it you can always find it right here on the 30 Day page at the top of this blog. Or simply Click Here. Every day I updated it with a direct link to the post. If you are wondering where our posts are this week for Food Rock Star and Real Food Weekly, they will be back next week! In the mean time go check out all of these great posts! Thanks Diane! This has been an awesome educational series thus far! This is so fabulous! That you for this big celebration! All of us at Gluten-Free Living are celebrating the growth in awareness as well and we hope to be your source for information. To celebrate, we are posting four helpful "how to" guides on our website for a free download this May. The first two are up, How to Embrace Gluten-Free Living and How to Read a Food Label. Check back each Friday for the next two installments. Thank you for letting us share our May festivities with you!